Well, I had quite the whirl wind of a weekend! I have been trying to blog every day but this past weekend was just non-stop! We had a HUGE group for the workout and just had a lot of fun with it, doing all sorts of new exercises and stations with different gear. After the workout, Dan and I went to lunch and got some Thai food (he’s Thai and has a friend who own a Thai restaurant so we went there.) It was sooo good! I could eat Thai all day, every day. After lunch, I came home, did some work on the computer for a few hours, and had every intention of going for a run but time just got away from me. At least I hit the gym in the morning! 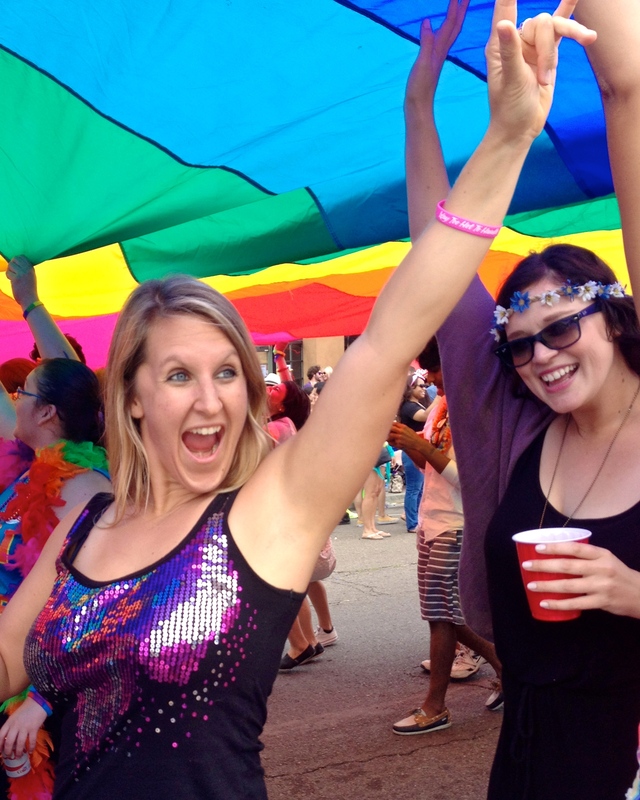 My roommate, his girlfriend and one of their friends came home and started drinking, as this was PRIDE weekend and we live in Hillcrest, literally houses away from the main street that the parade is on. I came out of my room and talked with them for about an hour, gaging whether I should go out and party with them that night or drive for Lyft and makes some money. I ultimately chose making money, and I’m glad I did because the ended up doing things that night that I’d rather not be involved with. The Lyft app was actually being a pain and gave me quite a challenge in connecting with people that night. I think it was basically because there were just so many people out and about, partying that the connection was really slow. I decided to call it quits around 11 and headed home to get some rest. Saturday was the big day! 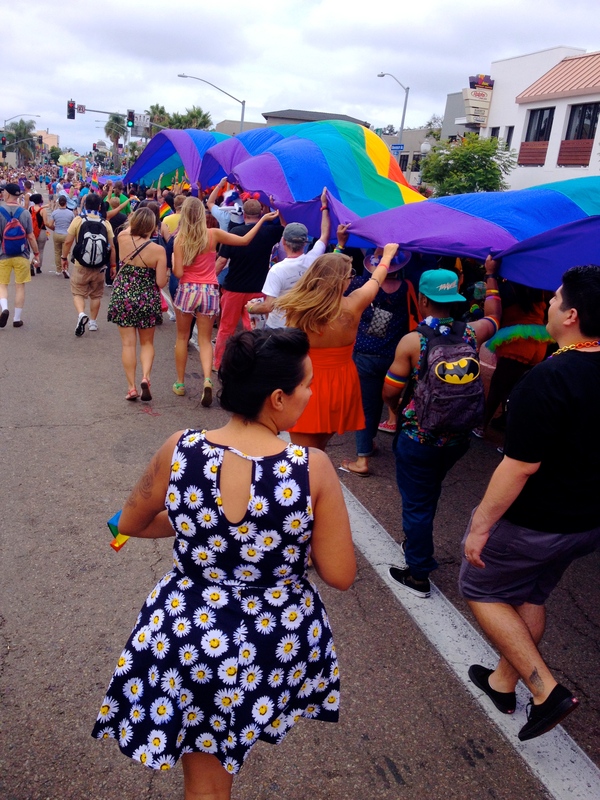 The PRIDE parade! I decided to take this entire day off to just enjoy it fully and have a little fun with my friends, especially since my new place was so central to all the festivities. My roommate had a bunch of his friends come over and I had a bunch of my friends come over, and we all just had a central party spot where we could drink, eat, use the bathroom, rest, etc. if need be. I haven’t really been drinking lately so it hit me pretty hard and fast. 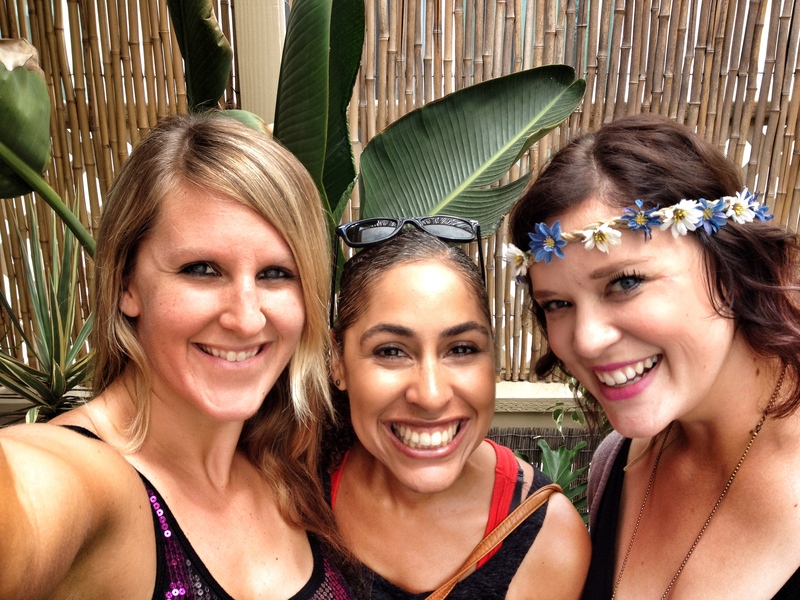 Me and Two of My Best Friends Ready to Hit the Streets for PRIDE! We ran up and down the streets, getting jello shots at bars, taking tons of pics, talking to people, watching the parade, etc. Man, was it fun! You could feel nothing but love all around! It was awesome! At the end of the parade came about a mile-long rainbow flag that we all ended up jumping under and thus became part of the parade! We ran under it for a couple miles, all the way to Balboa Park, where they were having a music festival. It was seriously SO MUCH FUN! We didn’t end up going to the music festival, but instead we just bounced around to a couple bars, until I realized I had dropped my ID somewhere. OOOPS! That would be the first time that happened to me. Now I feel for all of those who have done the same. Self-inflicted. That’s what I get, I suppose. We Got to be IN the Parade! Around 3:00 we were all hungry, but we all wanted different things, so we branched off. My friend Allison ended up at Project Pie in Hillcrest. It was A-MAZING and not too bad on the wallet. I got a BBQ chicken pizza and a kale caesar salad. YUM. I also really liked reading the huge chalkboard full of quotes 🙂 If you haven’t been there, definitely check it out! After lunch, we walked to the bar I thought I dropped my ID at, but had no success. Bummer. After that, we decided to walk back to my place, but first we needed some fro-yo, so we went to Golden Spoon. I think I got Cake Batter twirled with Chocolate something and then topped with brownie bites. MMM. We then walked back to my place and met up with some of my friends who ended up there, too. We all had some snacks and some water, kind of semi-napped, chatted a bit and by 6:00, everyone took off. I decided to make some eggs and go watch Netflix in bed. Next thing I knew, it was 6:00 in the morning and there was a plate of eggs, uneaten, next to my bed. Haha. I guess I had a bit too much to drink. I felt like absolute crap and remembered why I don’t party much anymore. It’s not worth feeling like you just want to DIE! I took my Herbalife tablets, and had the best hangover drink ever! I say this because I literally felt like I went from 0 to 100 in 5 minutes! My little concoction consisted of Mango Herbal Aloe Concentrate, Wild Berry Beverage Mix, Lemon Herbal Tea Concentrate and water. It had 70 calories, 15g protein, no sugar, was packed with antioxidants, helped soothe my stomach pain, and jump-started my energy! BOOM. I put together the beach workout that I was leading at 9:45, got all my stuff ready and was out the door by 9:15, pretty much feeling like A BOSS. I sat at the beach, all set up for about 40 minutes before people started showing up. We moved locations recently, so I think that was what confused people the most. Plus, most of the people who came were new to our Sunday Funday workout, so that could have been another culprit. 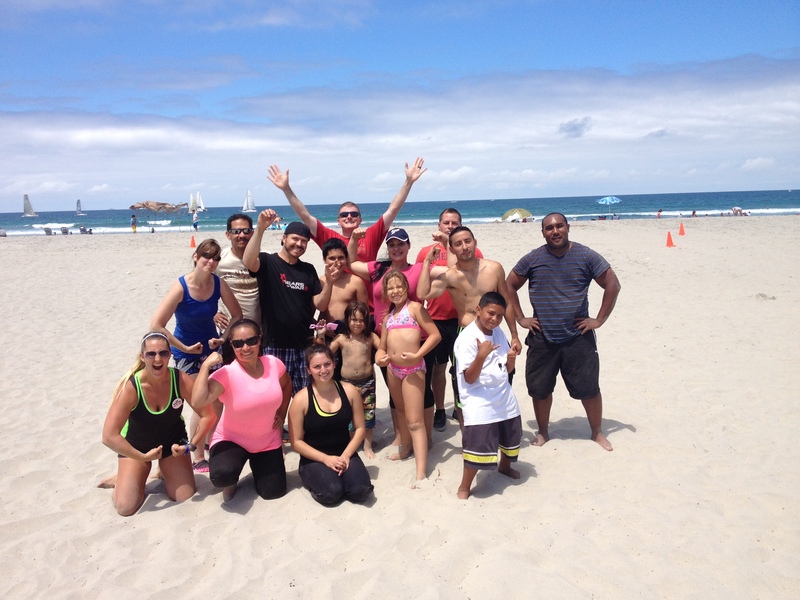 We ended up having about 12 people come out and had a really fun workout! I connected with everyone that I could, and even had someone come by who is an Herbalifer visiting from AZ, but is moving to San Diego in a few months. He saw our green and figured we were Herbalife. Smart guy! 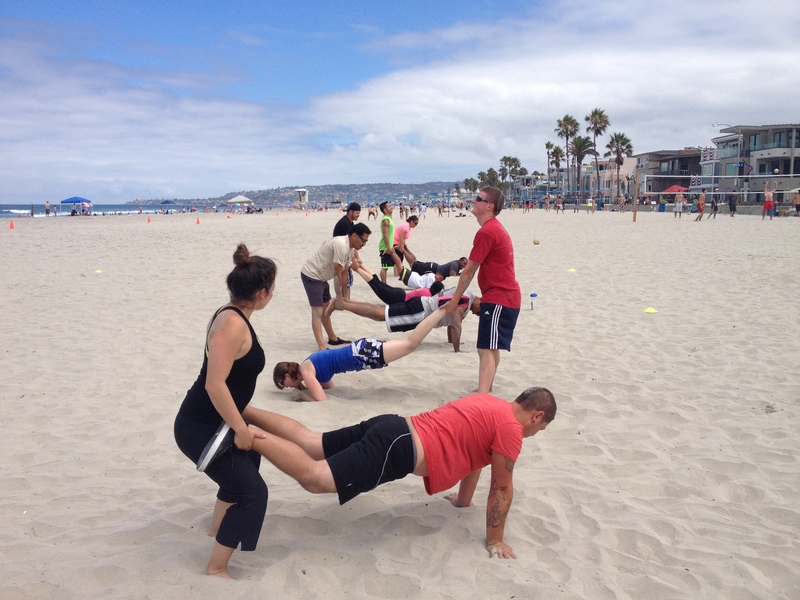 Our FREE Sunday Funday Beach Workout in Mission Beach! 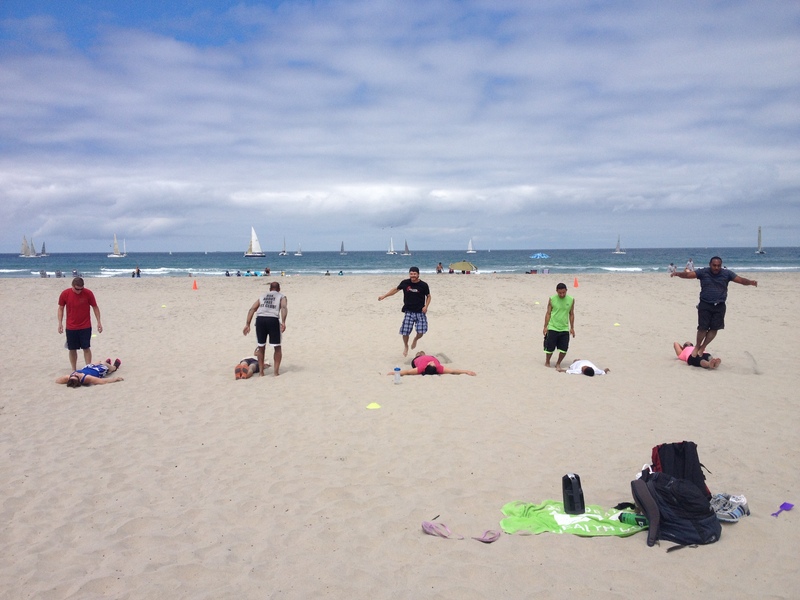 After the workout, I headed over to the volleyball courts and played some beach volleyball with our usual crew. It was a hot day out and so the bottoms of my feet started to get burnt from the sand after about 2 hours of playing. Once I ran out of water and started to feel dehydrated, I figured it was time to head home. I got home around 2 and my roommate and his friends were all laying around on the living room floor. Seeing that reminded me why I don’t want to be like them, wasting their days away. However, they had ordered some pizza and were nice enough to share some with me. That was just what I needed! We all sat around chatting for about two hours, and I found out one of the guys has been doing internet marketing for some time now, and has actually pretty successful at it! I picked his brain a bit and ended up getting some good ideas from him. It’s always good to meet new entrepreneurs and to network!